Plumbing, electrical and HVAC contractors must be licensed in Kentucky. Fire protection, HVAC, and plumbing systems, as well as boiler contractors are required to hold a license by the state. Each electrician is required to be certified by Kentucky state, as well as locally licensed. General contractors licenses are regulated for the county/city level. Experience, Exam, or Education: Are There Requirements for the Contractor License in Kentucky? It is best to check in with the local municipality and county regulations for this. Contractor Continued Education: Does Kentucky Require It? It is advised to check with local municipality and county regulations regarding this. NASCLA Accredited Commercial Contractor: Is This License Acceptable Within Kentucky? 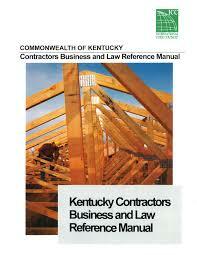 General Contractor Commercial Contractor: Is This License Required by Kentucky? It is best to check with local municipalities and the local county. Are There any Reciprocity With Kentucky and Different States? Check in with the local municipalities and the county regarding this. Any contractor who wishes to perform work on construction projects within the City of Louisville, Kentucky is required to obtain a license from the Louisville Metro Department of Codes & Regulations. The Department helps protect the health and safety of the public in and around the metro area by mandating businesses and individuals to maintain and hold the proper credentials and insurance. Building “A”: This will allow a contractor to perform work on structures and residential buildings. This credential will set to expire each year on the date of December 31st and will require six hours of continuing education. Building “B”: This will allow a contractor to obtain one building permit each year. This credential will last for the rest of the active timeframe of the permit. *The Department will offer other specialty license classifications for General Contractors, such as Plumbing, HVAC, Wrecking, etc. When filling out the application, it’s necessary to specify the nature of work the contractor intends to perform. All of the information provided on the application must be accurate and truthful. If there are any changes that happen to occur for the business or individual during the term of the license, the contractor must contact the Department within five business days of the expected change. Each license will be non-transferrable. Each contractor must also prove that they hold the appropriate insurance and bonding, as well as maintain them at all times while their license is in the active stage. Each contractor must have general liability insurance in the total amount of $250,000 per person, per occurrence with an aggregate total of $500,000. All contractors are required to hold worker’s compensation insurance if their business plans to hold employees. If the contractor is not going to hire workers, they must complete and send in a worker’s compensation exemption affidavit. General Contractor: This will allow contractors to perform work on public works, commercial works and industrial structures, as well as residential structures with four or more single-family units. This registration option will allow all contractors to specialize in two or more unrelated trades. General Contractor- Residential ONLY: This will allow contractors to perform work on residential structures who have less than four single-family units. The registration option will allow contractors to specialize in two or more unrelated trades. *The Division of Building Inspection will offer other specialty trade registration options for contractors, such as framing, plumbing, drywall, masonry, etc. General Contracting offices that are located within Fayette County must obtain a Zoning Compliance Permit from the Division of Planning. General Contracting offices that are located in Fayette County will need to obtain a Certificate of Occupancy from the Division of Building Inspection. The cost will be $10 for contractors who are working out of an office from home and a $25 fee for contractors who are working out of a commercial building. Each contractor is responsible for obtaining their Occupational Business License from the Division of Revenue. Each contractor is required to obtain worker’s compensation insurance and liability from the Division of Building Inspection. General Contractors are obligated to obtain a liability policy that totals $500,000 per occurrence, and General Contractors-Residential ONLY is obligated to hold general liability totaling $250,000 per occurrence. If the contractor plans to hire workers, they will need to obtain worker’s compensation insurance; otherwise, they will need to fill out a worker’s compensation exemption affidavit. All contractors must complete and send in theContractor Registration Application. *Contractors who have offices outside of the Fayette County can skip step one and two. The City of Bowling Green makes sure that each contractor performs work within the city, and Warren County, are all in compliance with local laws and ordinances that are set in order to protect the health and well-being of the public. Each contractor must obtain a license from the Bowling Green-Warren County Contractor Licensing Board before beginning any work on construction projects. *The Contractors Licensing Board will offer a standard, General Contractor License, as well as a Specialty Contractor License for any contractors who specialize in a certain trade. General Liability Insurance certificate, this is to show the “Contractors Licensing Board” as the certificate holder. The policy should be in the minimum amount, totaling $100,000 per occurrence. A certificate for worker’s Compensation Insurance if the contractor plans to hire any workers. If the contractor does not plan to hire any employees, they are required to complete a worker’s compensation exemption affidavit and will need to have it signed and notarized. If the contractor’s business is a partnership, they will be required to submit a signed and notarized Partnership Agreement. There is a non-refundable license fee of $250 that is required to be submitted, along with the application. If the contractor’s office is located within the city limits of Bowling Green, they are required to hold a Bowling Green Occupational Business License. To receive this license, you will need to visit the Finance Department at the Bowling Green City Hall Annex. If the contractor’s office is located within Warren County, but is outside of the city limits of Bowling Green, they will be required to obtain a Warren County Occupational License. There will be no fee associated with this licensure. Question: How do I register my construction company in Kentucky? What forms do I need to register my new company in Kentucky? Question: How do I look up a company in Kentucky or see if a company name is available to register?